PortalProdigy allows you to easily access and update all of your organization’s contacts from anywhere at anytime. This includes customers, prospects, vendors, manufacturers, contractors, employees, investors, partners, media, experts and more. PortalProdigy provides everything you need to maintain detailed information about each contact including their addresses, phone numbers, biographical information, notes, appointments, professional information, company information, special interests and more. PortalProdigy’s contact database is fully integrated with PortalProdigy’s other features including customer relationship management (CRM). This allows you to access a contact’s transaction history, sales opportunities, RFQs, quotes, order status, shipment tracking status, membership information, and payment information directly from their contact record. PortalProdigy also provides everything you need to schedule appointments, tasks, and activities related to contacts. Easily import prospect lists and existing contacts. 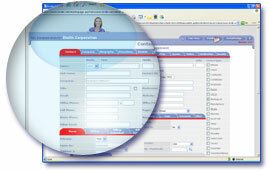 Contact records are automatically created when new users register on your Website. Send automated email broadcasts to selected contacts. Print a variety of reports. PortalProdigy’s CRM capabilities allow you to manage all your prospecting and sales activities online, from lead generation to closing. Import leads, track sales calls, gather valuable information, schedule meetings, generate quotes, process credit applications and grant credit terms, automatically convert quotes to orders, and report on the entire process. Easily drill down into the details. PortalProdigy’s CRM is fully integrated with contact management, quotation management, credit management, order management and fulfillment, product catalog and inventory, and payment processing. Unlimited number of contact records. Store contact’s home, office, billing, and shipping information including addresses and phone numbers.